Apple is scheduled to report quarterly earnings for the third quarter of 2018 at the end of trading on July 31, while an ensuing investors conference call will provide details of the three-month period. 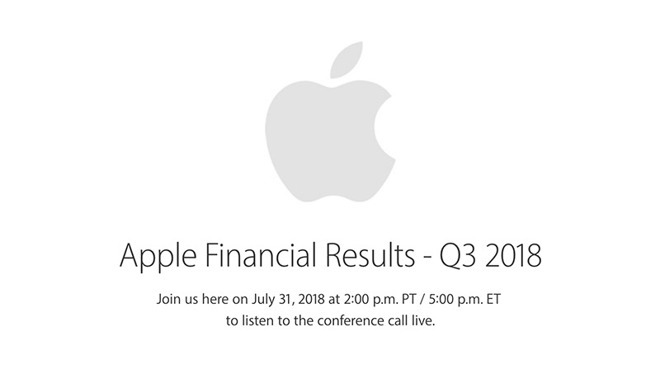 Announced in an update to its Investor Relations webpage, Apple's third quarter conference call is slated for Tuesday, July 31 at 2 p.m. Pacific, 5 p.m. Eastern. As usual, CEO Tim Cook and CFO Luca Maestri are expected to detail segment performance over the June quarter and and field questions from investment analysts. Apple reported its best March quarter ever earlier this year, raking in $61.1B in revenue on the back of 52.2 million iPhone sales and strong services growth. Notably, premium iPhone X handset sales drove iPhone's average selling price to $728.30, a market increase from $655 in the second quarter of 2017. "Customers chose iPhone X more than any other iPhone each week in the March quarter, just as they did following its launch in the December quarter," Cook said during last quarter's conference call. Whether Apple's top-end phone held the top spot over the third quarter is unknown, but investors are keen to learn of the handset's performance amid a global slowdown in smartphone sales. Previous reports leading up to the March quarter reveal claimed iPhone X was a flop. Recent industry forecasts show positive growth for Apple's handset, with continued sales to new adopters and upgraders. Interestingly, research suggests Android switchers still account for a major chunk — as much as 20 percent — of quarterly shipments. Beyond hardware, Apple's services business, which includes AppleCare, Apple Music, Apple Pay, iTunes and the App Store, and licensing, continues to exceed expectations. Last quarter, the company's services arm grew revenue by 31 percent on a year-over-year basis, reaching $9.19 billion. For the current quarter, Apple is forecasting revenue between $51.5 billion and $53.5 billion, with a gross margin of between 38 percent and 38.5 percent. AppleInsider will offer full coverage of the earnings reveal on Tuesday, July 31, starting at 2 p.m. Pacific, 5 p.m. Eastern.